What Exactly is a Tabletop Role-Playing Game Anyway? We often talk about how Wheelhouse Workshop “helps teens build social skills using tabletop role-playing games.” We say that our groups will help teens become, “more confident, creative, and socially capable.” We’ve been facilitating games therapeutically for over five years, we’ve spoken at conventions around the country and even taught a class to therapists about these games, and yet we still hear the question all the time.. and have trouble answering it concisely. Parents interested in our groups and referring therapists sometimes have a loose idea of how our groups are structured, but aren’t sure of the what their kids and clients will be experiencing in a Wheelhouse Workshop group, much less how they will benefit. So what exactly is a “tabletop role-playing game?” We’ll unpack the term one word at a time. The term “tabletop” means that all of the players are seated around a table interacting with each other directly. An important distinction between tabletop games and other types of games such as electronic games or athletic sports is the interpersonal experience. There are no screens at Wheelhouse Workshop groups because in order to build relationships and practice skills we must be present with each other in the same space, interacting verbally and nonverbally with other people. What makes role-playing games different from other tabletop games is the focus on characters participating together in a story. In a role-playing game the players are creating and interacting with the world of the game as their character. When playing the game Monopoly, for example, players aren’t (usually) thinking about why the metal terrier wants to build a hotel on Broadway other than the rules of the game that let players know how they should be playing and what should be motivating them, and rarely do players think about what relationship the terrier has to the iron, or what tempestuous history the thimble shares with the top hat. In tabletop role-playing games and especially in Wheelhouse Workshop groups, players think about what motivates their characters and how their characters will set goals and make plans to accomplish them. The game is set in an open world that changes based on the decisions of the characters, so the decisions players make for their characters is reflected in the larger story. The characters played by the players are on a team working together to accomplish a goal. Think of the Fellowship of the Ring from The Lord of the Rings—a team of heroes bands together, despite their differences, to work toward a common goal. Their character does not exist solely in their head, however. Their character’s specific background, skills, and abilities are recorded on a piece of paper that the player uses in the game. The amount the player portrays the character by role-playing (talking in a unique voice, etc.) is up to the player themself, and we encourage our players to take the risk to play as their character when possible. Game theorists have been trying to define what makes a game a game for centuries. Though fairly self-explanatory on the surface and deceptively complex upon further inspection, most game theorists agree that games have rules and structure, goals, and that players want to keep playing them. 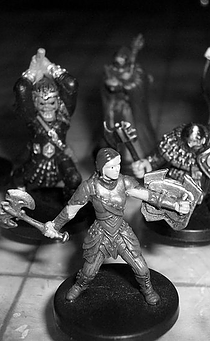 Game designers design different tabletop role-playing systems to provide structures and rules to keep the game somewhat predictable and provide players an opportunity to improve at them. Games are also supposed to be fun, which makes the players want to keep coming back. In a Wheelhouse Workshop group, we use modified rules from the game Dungeons and Dragons, which has been around in various formats since the 1970s. The game, like many other tabletop role-playing games, uses many-sided dice to determine the success of what a player is trying to do as their character, which provides both a structure and an unpredictability to the game. While many traditional games are competitive, in a tabletop role-playing game the players are working together against the challenges created by someone taking the role of a “game master.” In the case of Wheelhouse Workshop groups, the game master is a trained facilitator who structures the game to provide challenges specific to the players’ real world areas of social growth. Tabletop role-playing games provide many benefits no matter how they are played. In Wheelhouse Workshop groups, we focus specifically on these benefits so that players can become more confident, creative, and socially capable. To learn more, continue reading.